Onboarding won’t succeed if it’s a passive, standalone, rigid flow. It needs to be a well-integrated part of your core product experience. To achieve this, onboarding must focus on the key actions that lead users to long-term success, retention, and engagement. And, to accommodate users in different situations, it needs to be flexible enough to allow these key actions to appear in different orders. In an earlier post, I covered how to identify key actions. In that same post, I also covered how to break key actions down into modules so they can be scaffolded with guidance. The 3 parts of a key action module are its trigger (the part that initiates action), its activity (the heart of the action), and its follow-up (the part that closes out the action and moves people on to next available key actions). First, it makes it easier to see where guidance is needed, and how to apply it throughout the course of action. This leads to interactive, user-paced guidance, instead of passive, single-paced solutions. Second, the follow-up component forces designers to think about how one key action can lead to other key actions. It helps teams think of onboarding as a flexible, user-defined experience instead of as one fixed path. To help your teams to break down your key actions, I’ve created a storyboard template. 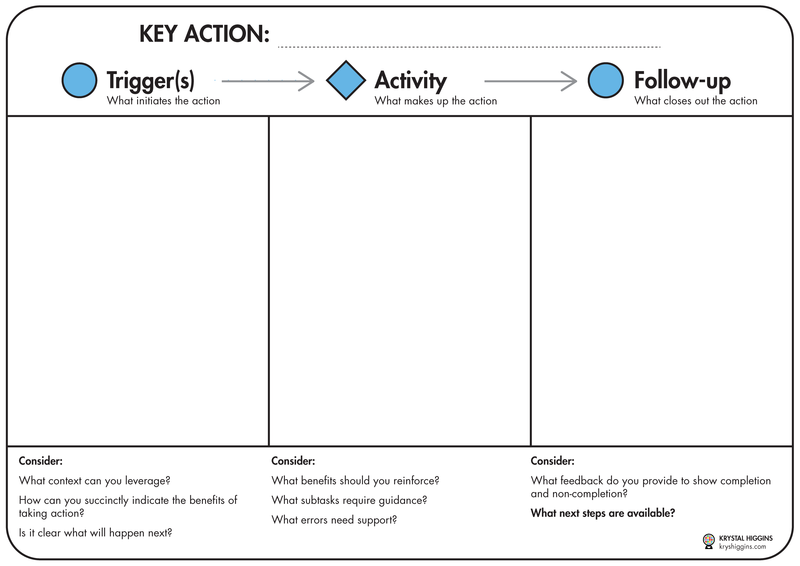 This template has 3 panels to help you to sketch guidance for each key action’s trigger, activity, and follow-up components. At the bottom of each panel is a list of what types of guidance you may need to provide. Select the image to get a full-size version! 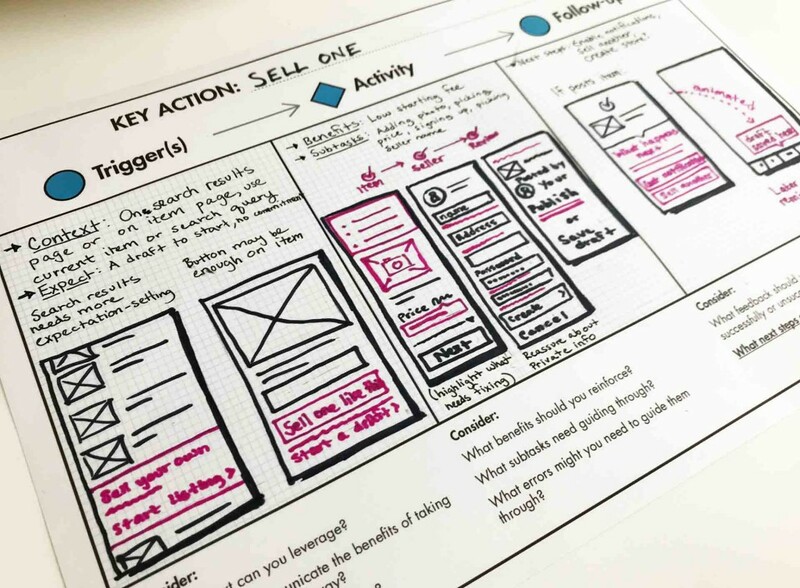 Assign one key action per storyboard template, and use many templates to break down different key actions. Then you’ll be able to see opportunities for linking together different key actions based on their trigger and follow-up components. You can also use multiple templates to sketch out how guidance for one key action may vary across different user contexts.